Create new project from default project. You have the possibility to press on Set current project as default or on Reset default. You can browse through your files and define a directory where you find your user-defined project templates. This will be added to Project ‣ New From Template. If you first activate Create new project from default project and then save a project in the project templates folder. System environment variables can now be viewed, and many configured, in the Environment group (see figure_environment_variables). This is useful for platforms, such as Mac, where a GUI application does not necessarily inherit the user’s shell environment. It’s also useful for setting and viewing environment variables for the external tool sets controlled by the Processing toolbox (e.g., SAGA, GRASS), and for turning on debugging output for specific sections of the source code. Representation for NULL values. Here, you can define a value for data fields containing a NULL value. With RGB band selection, you can define the number for the Red, Green and Blue band. Validate geometries. Editing complex lines and polygons with many nodes can result in very slow rendering. This is because the default validation procedures in QGIS can take a lot of time. 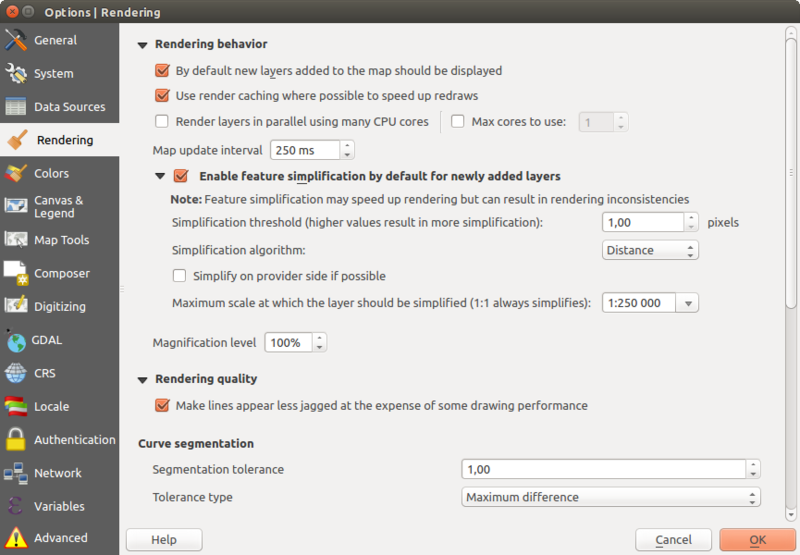 To speed up rendering, it is possible to select GEOS geometry validation (starting from GEOS 3.3) or to switch it off. GEOS geometry validation is much faster, but the disadvantage is that only the first geometry problem will be reported. The next 3 options refer to the Offset Curve tool in Advanced digitizing. Through the various settings, it is possible to influence the shape of the line offset. These options are possible starting from GEOS 3.3. GDAL is a data exchange library for raster files. In this tab, you can Edit create options and Edit Pyramids Options of the raster formats. You can define which GDAL driver is to be used for a raster format, as in some cases more than one GDAL driver is available. This area allows you to define the action to take when a new layer is created, or when a layer without a CRS is loaded. For more information on how QGIS handles layers projection, please read the dedicated section at Working with Projections. In the Authentication tab you can set authentication configurations and manage PKI certificates. See Authentication System for more details. Socks5Proxy: Generic proxy for any kind of connection. Supports TCP, UDP, binding to a port (incoming connections) and authentication. HttpProxy: Implemented using the “CONNECT” command, supports only outgoing TCP connections; supports authentication. HttpCachingProxy: Implemented using normal HTTP commands, it is useful only in the context of HTTP requests. FtpCachingProxy: Implemented using an FTP proxy, it is useful only in the context of FTP requests. 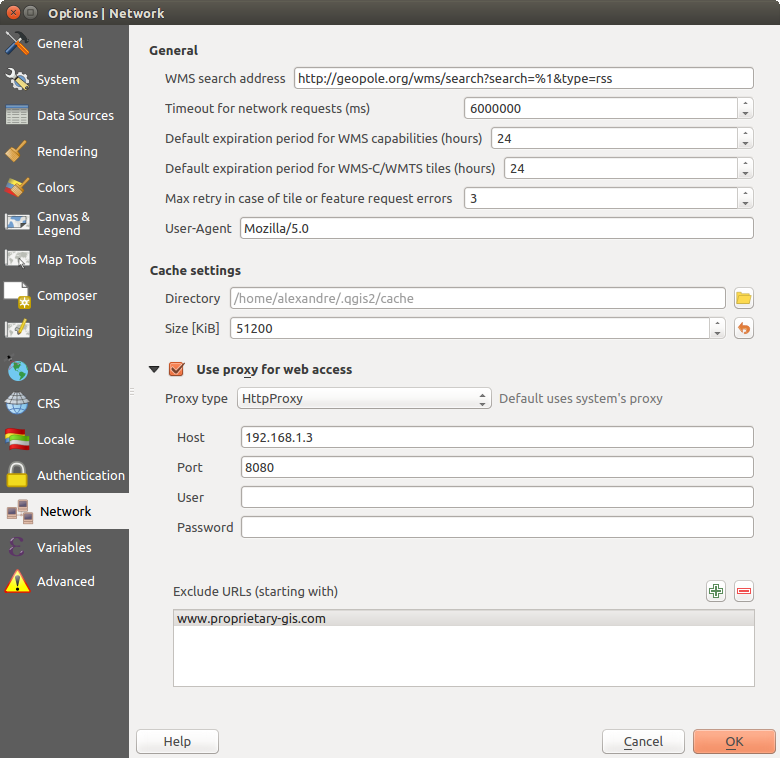 Excluding some URLs can be added to the text box below the proxy settings (see Figure_Network_Tab). The CRS tab enables you to choose the Coordinate Reference System for this project, and to enable on-the-fly re-projection of raster and vector layers when displaying layers from a different CRS. 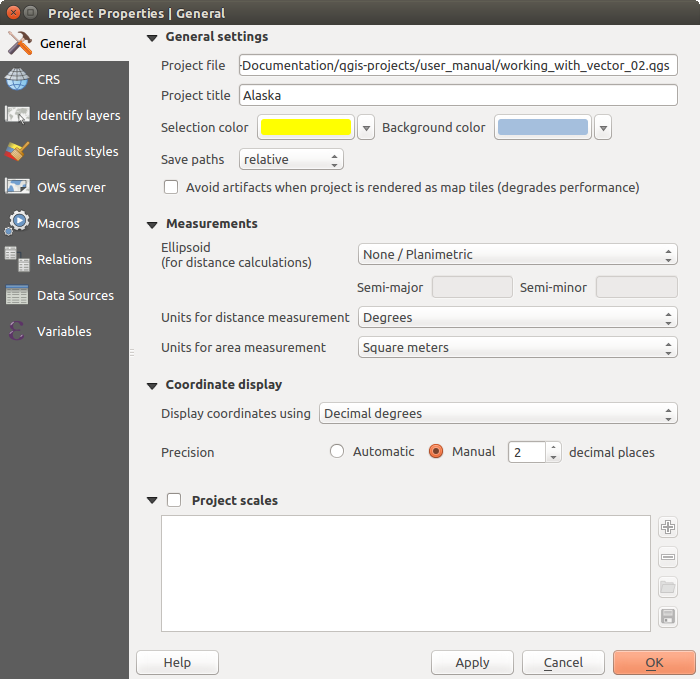 For more information on projection’s handling in QGIS, please read Working with Projections section. The Relations tab is used to define 1:n relations. 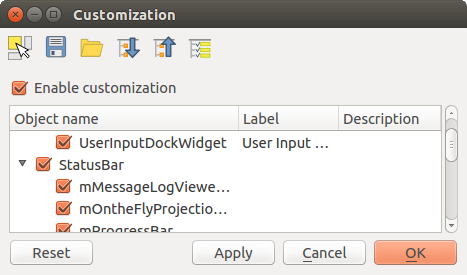 The relations are defined in the project properties dialog. Once relations exist for a layer, a new user interface element in the form view (e.g. when identifying a feature and opening its form) will list the related entities. This provides a powerful way to express e.g. the inspection history on a length of pipeline or road segment. You can find out more about 1:n relations support in Section Creating one or many to many relations. Before your changes are applied, you need to restart QGIS. 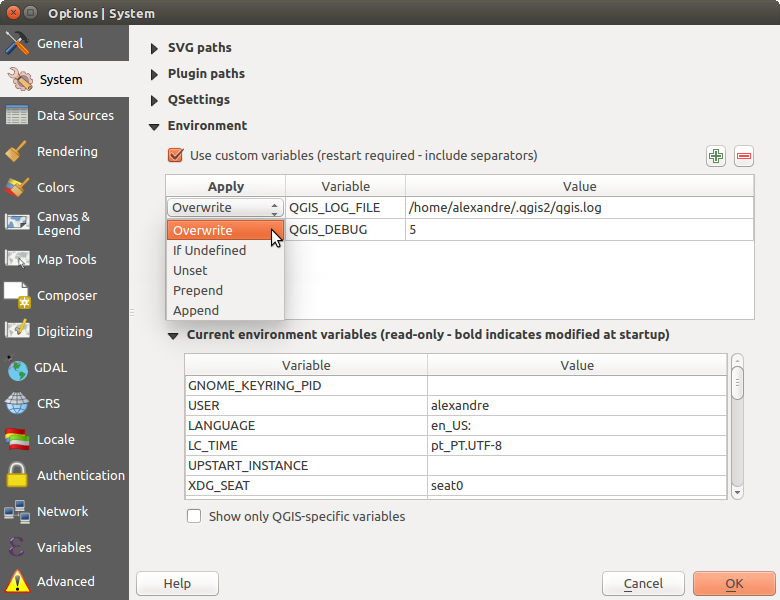 QGIS provides default keyboard shortcuts for many features. You can find them in section Menu Bar. 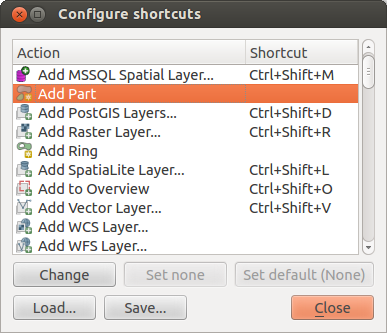 Additionally, the menu option Settings ‣ Configure Shortcuts... allows you to change the default keyboard shortcuts and add new keyboard shortcuts to QGIS features.